Dominica Accepts TRIPS Health Amendment; Two More To Go? The government of Dominica has deposited its instrument of acceptance of the 2005 so-called “paragraph 6” amendment to international intellectual property trade rules aimed at making it easier for countries to export affordable medical products to developing countries. Dominica’s signing brings the number of signers to 65 percent of WTO members, according to the WTO. Two-thirds of WTO members must accept it for the amendment to go into effect, but it is unclear exactly how many members that represents. It appears that two or three more members will tip the scale. 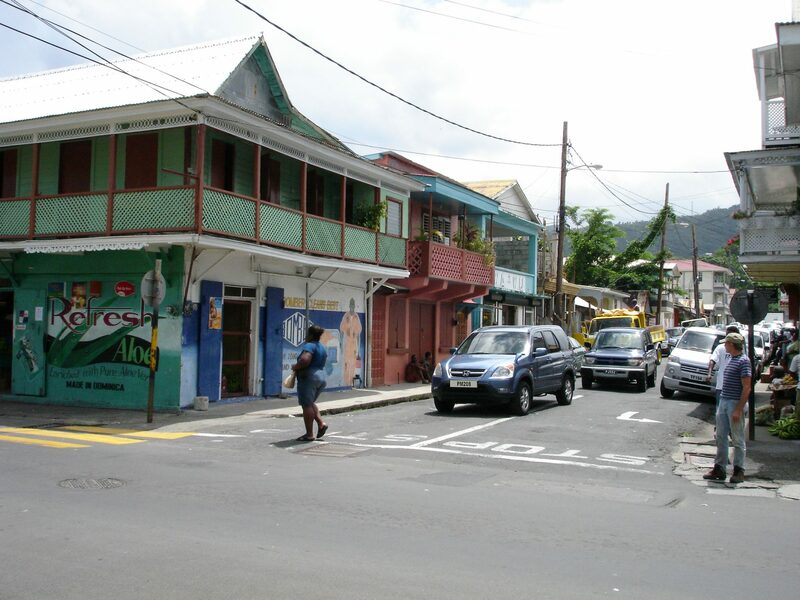 A street in the Dominica capital of Roseau. Will affordable medicines flow there? The amendment to the WTO Agreement on Trade-Related Aspects of Intellectual Property Rights (TRIPS) is a waiver to a rule that limits medical products made under compulsory licence to be predominantly for the domestic market. WTO has been encouraging members to accept it, despite misgivings about the amendment by some academics, health advocates and the generic drug industry (IPW, WTO/TRIPS, 14 November 2016). They argue that the waiver does not work and locking it in now would make it more difficult to find a solution that actually does work. According to the list of members accepting the amendment, with Dominica, 79 of 164 WTO members, plus the European Union, have accepted it. But it is a little unclear whether the EU counts as 28 or 29 members – even before the Brexit departure of the United Kingdom from the union. According to a former WTO spokesperson, the WTO counts the EU as 28 members plus itself for a total of 29 (IPW, WTO/TRIPS, 14 April 2016). But the European Commission says the EU is only 28 total. Assuming conservatively that the EU is 28 members, plus the 79 other members, would bring the total to 107. That is consistent with the WTO’s calculation that Dominica’s acceptance brings the total to 65 percent of members. A calculation shows 67 percent (two-thirds) of 164 members to be either 109 or 110 members, which would mean there only needs to be 2 or 3 more members before it goes into effect. Dominica deposited its instrument of acceptance for the 2005 protocol amending the WTO’s Agreement on Trade-Related Aspects of Intellectual Property Rights (TRIPS) on 28 November 2016. The protocol amending the TRIPS Agreement, which was agreed in 2005, is intended to formalize a decision to ease poorer WTO members’ access to affordable medicines. The protocol allows exporting countries to grant compulsory licences (one that is granted without the patent holder’s consent) to their generic suppliers to manufacture and export medicines to countries that cannot manufacture the needed medicines themselves. These licences were originally limited to predominantly supplying the domestic market. With Dominica’s acceptance, over 65 per cent of WTO members have submitted their instruments of acceptance for the TRIPS protocol. The protocol will enter into force once two-thirds of the WTO membership has formally accepted it. The up-to-date list and map of members that have accepted the protocol are available here. More information on the issue of TRIPS and public health is available here. "Dominica Accepts TRIPS Health Amendment; Two More To Go?" by Intellectual Property Watch is licensed under a Creative Commons Attribution-NonCommercial-ShareAlike 4.0 International License. The TRIPS amendment may need a lot more acceptances to reach two-thirds of the WTO membership. EU member states are parties to the original TRIPS Agreement but most have not deposited an instrument of acceptance of the TRIPS amendment. That makes a big difference because there are 28 EU member states. The EU only says its member states are bound as a matter of EU law, but that is a different matter from WTO law. How do we know if other WTO Members are satisfied that the TRIPS amendment is binding on, say, Britain, home to two pharmaceutical giants, when there is no acceptance with a British signature on it?